This Museo Mundial installation focuses on fair trade. Fair trade is an initiative in which the production and distribution of goods is based on dialogue, transparency and respect, and which strives for greater equity in international trade. Contributing to sustainable development, fair trade guarantees respect for human rights throughout the production chain. In a globalized world, where access to products transcend frontiers, we cannot neglect the life stories behind the products we consume. We have to know the product and its impact on the development cycle. So, how can we approach this subject in a way that explores the full scope of the issue? We came up with a board game, using cards with questions and answers, where the visitor is invited to reflect and to act. What do we truly know about the products we purchase? We know that in addition to the environmental challenges posed by excessive production and distribution we have to look at the human challenges. In fact, we must ensure that human dignity, along with social, environmental and economic values, are respected throughout the entire production chain, from planting (in the case of food) through to the moment when the product comes into our possession. What is the best solution to this challenge? The promotion of fair trade. 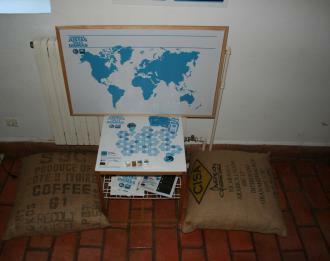 The installation is in the form of a board game on the topic of fair trade. The idea of the game is that children travel along a path symbolizing the topic of fair trade. In each position along the path, there are different colours and icons, corresponding to certain cards that must be read. The cards are divided into two categories, according to the children's age group. The installation is accompanied by two beanbags made from old coffee sacks to sit on. Every day, from waking to bedtime, at home or in our working environment, we have access to a wide range of products: food, electronics, clothing, cosmetics, cultural products, and so on. But do we know where they come from? Or anything about their origin, life cycle, and the impact that their production, distribution and consumption has on different target groups? 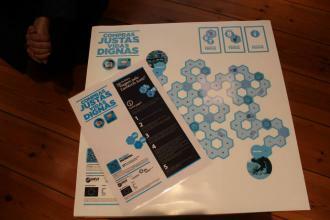 It was after considering these questions and reflecting on the coherence between promoting global values and consumer behaviour, that the project team decided to create an installation on fair trade. It is important to ensure that our subject, as well as the approach that we want to take, complements the chosen area inside the Museum (consistent with the artefacts). This can be achieved by the relevance of the object, the room name or a whole set of factors that must first be identified. Ideas are like gold dust, but unless they are made reality they turn into plain old dust. Indeed, after identifying the approach, the idea and the location to place the installation, we need to focus our attention on implementing our idea. As such, it is necessary to find suppliers capable of rising to the challenge, which in this case entailed producing an innovative installation at a low cost. As part of this process, we should always ask the Museum to pass on the details of companies with whom they usually work, to facilitate the call for bids process. In discussions with the project team, always consider the types of materials to be used in the installation, remembering to favour materials that are recycled, reused or environmentally and socially certified. During this process, there should be open dialogue and a willingness to adapt to new ideas..
You may or may not choose to have a set of support materials to raise further awareness on your topic. What kind of materials can we develop to support the creative, educational and informative aspects of the installation? How can we call on visitors to take action and to adopt sustainable consumer behaviour? When we talk about fair trade, we focus on a set of ethical, social, environmental and commercial dimensions that make reflecting on this issue a priority in terms of Education for Global Citizenship. However, when faced with space constraints, we should be able to select the most fundamental aspects and arouse the reader's curiosity to find out more. Research: Collect data and facts, ensuring they are current, accurate, and from reliable and credible sources. If the data is complex, confusing or contradictory, the messages will be questioned by the reader. Writing: The language should be accessible to all types of public, paying attention to typography (font, size and colour) to facilitate reading. The message cannot be biased and should present arguments based on facts that can be substantiated by the visitor. Final text: We should present facts that can be substantiated and suggest ways to act. The text should be positive and optimistic. Leaflet: Visitors are invited to promote fair trade and the economic development of all continents, as well as to help reduce poverty. The brochure asks the visitor about his/her knowledge of what he/she consumes and of the working conditions involved in the production, processing and marketing of products. It also stresses the need for an overall change in the rules and practices of conventional trade and shows how a successful business can put people first. The wake-up call is delivered through a slogan: "Fair Shopping, Worthy Lives". It contains a clear and effective message that fair trade is a prerequisite for a dignified life. Signpost: it attracts attention to the installation and the theme. Opt for a picture with a brief caption. We sought to integrate the installation into a section of the museum that displays progress between the 1920s and the 1950s. We decided to address the issue of increased consumerism over that period to promote the idea of fair trade. In order to vary the type of installation within the overall project, we chose to set up a board game. This would create a “stopping point” for visitors to reflect on this theme through interacting with the game. This game is a hybrid of two game genres: the “Jogo da Glória” (a variant on Snakes and Ladders using dice and a progression path) and “Trivial Pursuit” (the use of cards with questions and answers). 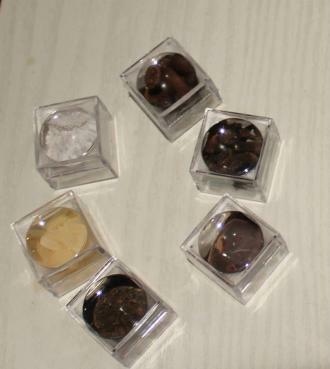 Game elements: two dice and six playing pieces made from glass cases filled with fair trade products (such as coffee, rice, textiles, chocolate, sugar, tea and spices). The game is based on the logic of the “Jogo da Glória”, where children travel along the game path symbolizing the topic of fair trade. In each position along the path there are different colours and icons. Each colour code corresponds to certain cards that must be read. The cards are divided into two categories, according to the children's level. There are 20 cards with questions (10 cards in each category). The installation is accompanied by two beanbags made from old coffee sacks. The installation was placed next to objects illustrating the domestic environment of families living between the 19th century and the mid-20th century. This domestic environment is based around textiles and costumes. Through furniture, photographs and newspapers, we may learn about how the household developed during this era. On display are several products that can be acquired ethically and fairly (like tea and textiles). The installation was inaugurated on World Tea Day (December 15). As Christmas falls within this month, it is also a season characterized by consumerism. The installation was thus associated with the need to ensure fair and equitable trade. Over the following days, we continued to post computer graphics, reports, videos and images to raise awareness on the need to adopt fair and ethical consumer behaviour. If appropriate and if the museum is big enough, you may wish to hold an official inauguration of the installation, which could follow various formats including debates, movie previews, or family activities. One example would be for museum staff to host and promote a “fair tea” session. Two glass bottles were placed next to the installation, one with pebbles and the other one empty. In this way, the visitor is invited to put a pebble in the empty bottle if he/she enjoyed the installation. Games provide the perfect way for children to interact and learn. The common theme running through the playing pieces reinforces the idea that there are a set of food products being sold in accordance with the rules of fair trade (such as coffee, rice, cotton and tea), and that these can easily be purchased. The game causes the visitor to stop and take a closer look. The adult audience may view the installation as something just for children and, therefore, not interact with it. The number of simultaneous players is limited to a maximum of six..
A successful installation that combines play and learning. It provides a springboard for the museum’s education services to organize a diverse range of support activities. Visitors gave positive feedback on: how the installation complemented its surroundings; its creativity; the playing pieces in the game; the board; the beanbags; the fact that it is mobile; the learning dimension; and the “fun way to learn things”. They gave negative feedback on how long the activity lasts. Asked about what they would do differently, visitors said that they would increase the size of the board and would add more information on fair trade, such as the prices of the products and the salaries of workers in developing countries.